This tutorial will cover the steps to create a copy of a test for a student who needs extra time. The situation where this would be used is when the student has a documented disability with the Office of Student Disabilities. 1. Navigate to the Control Panel located underneath the course menu. 2. Click on the Course Tools link to expand the sub-menu. 3. Click on the Test Surveys and Pools link. 5. 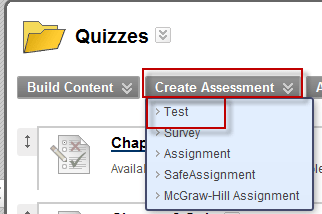 Select the test you wish to copy and click on the drop down arrow next to the test. Click on Copy. 6. Blackboard will make a copy of the test and call it the same name as the original. The only different is a 1 in parentheses after the name. A recommended practice is to change the name. 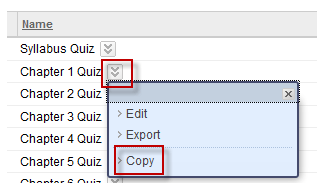 Click the drop down arrow next to the copied test and select edit. 7. Change the name clicking the drop down arrow next to the test name and select edit. After changing the name, click on submit. 9. Select the test from the list and set the settings for the Test. 10. Your test is available to all the students at this point. The next step is to restrict to the student who needs more time. Select the test with extra time and click the drop drown arrow. Click on Adapted Release. 11. Scroll down until area 2: Membership. If you know the student’s atlas username, type it in and click submit at the bottom of the page. If not, click browse. 12. Change Username to Last name and type the student’s last name in the Term box. Click on Go. 13. This will list the student. Click on the check box at the beginning of the student’s name and click Submit. 14. The student’s username will appear in the username box. Click Submit at the bottom of the page. 15. The last step is to hide the grade column for test with extra time. This will help eliminate confusion from the rest of the class as for what the extra grade column is for. Go to the Control Panel and select the sideways arrows next to Grade Center. 16. 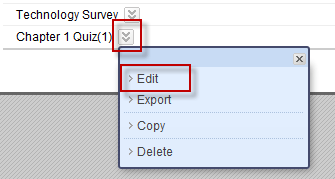 Go to the extra time test grade column and select the drop down arrow next to the column name. 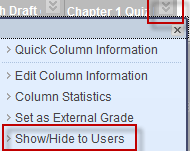 Select Show/Hide to Users. 17. The student who takes the extra time test will have their score show up in the extra time test column. The score can be manually entered into the non-extra time test column.